The Arizona Diamondbacks visit AT&T Park on Sunday, September 17, 2017 to play the San Francisco Giants. The probable starters are Taijuan Walker for the Diamondbacks and Chris Stratton for the Giants. The opening line for this matchup has Arizona at -152 and San Francisco at +142. The Diamondbacks have a 66-74-8 over/under record and a 81-67-0 run line mark. The Giants are 63-86-0 against the run line and have a 70-67-12 over/under record. The Diamondbacks have a 86-62 overall record this season. Starting pitcher Taijuan Walker has a 9-7 record with an earned run average of 3.32 and a WHIP of 1.30. He has 130 strikeouts over his 143.2 innings pitched and he's given up 132 hits. He allows 8.3 hits per 9 innings and he has a FIP of 4.09. The bullpen has an earned run average of 3.85 and they have given up 405 base hits on the year. Teams are hitting .236 against the bullpen and they've struck out 443 hitters and walked 168 batters. As a team, Arizona allows 8.1 hits per nine innings while striking out 9.3 batters per nine innings. They are 3rd in the league in team earned run average at 3.57. The Diamondbacks pitchers collectively have given up 1,189 base hits and 523 earned runs. They have allowed 152 home runs this season, ranking them 29th in the league. Arizona as a pitching staff has walked 461 batters and struck out 1,367. They have walked 3.1 men per 9 innings while striking out 9.3 per 9. They have a team WHIP of 1.25 and their FIP as a unit is 3.71. As a team Arizona is hitting .255, good for 18th in the league. The Diamondbacks hold a .443 team slugging percentage and an on-base percentage of .328, which is good for 13th in baseball. They rank 16th in MLB with 8.7 hits per game. David Peralta is hitting .294 with an on-base percentage of .347. He has 143 hits this season in 486 at bats with 49 runs batted in. He has a slugging percentage of .442 and an OPS+ of 98. Paul Goldschmidt is hitting .309 this year and he has an on-base percentage of .416. He has totaled 158 hits and he has driven in 113 men in 512 at bats. His OPS+ is 149 while his slugging percentage is at .584. The Diamondbacks have 1,288 hits, including 291 doubles and 196 home runs. Arizona has walked 516 times so far this season and they have struck out 1,352 times as a unit. They have left 1,022 men on base and have a team OPS of .771. They score 4.96 runs per contest and have scored a total of 734 runs this year. San Francisco has a 57-92 overall mark this year. With an earned run average of 4.07, Chris Stratton has a 2-3 record and a 1.55 WHIP. He has 38 strikeouts over the 42 innings he's pitched. He's also given up 42 hits. He allows 9 hits per nine innings and his FIP stands at 3.99. The bullpen has an earned run average of 4.54 and they have given up 461 base hits on the year. Teams are hitting .260 against the Giants bullpen. Their relievers have struck out 422 batters and walked 205 opposing hitters. As a team, San Francisco allows 9.5 hits per nine innings while striking out 7.7 batters per nine innings. They are 21st in the league in team earned run average at 4.63. The Giants pitchers as a team have surrendered 1,416 base knocks and 688 earned runs this season. They have given up 171 home runs this year, which ranks 25th in Major League Baseball. San Francisco as a staff has walked 459 hitters and struck out 1,140 batters. They give up a walk 3.1 times per 9 innings while they strike out 7.7 per 9. Their team WHIP is 1.40 while their FIP as a staff is 4.25. As a team, they are batting .247, good for 24th in the league. The Giants hold a .379 team slugging percentage and an on-base percentage of .307, which is good for 29th in baseball. They rank 21st in MLB with 8.5 hits per contest. Denard Span comes into this matchup batting .269 with an OBP of .326. He has 123 hits this year along with 41 RBI in 458 AB's. He maintains a slugging percentage of .430 with an OPS+ of 98. Joe Panik is hitting .287 this season and he has an OBP of .347. He has collected 134 hits in 467 at bats while driving in 49 runs. He has an OPS+ of 103 and a slugging percentage of .424. The Giants as a unit have 1,268 base hits, including 267 doubles and 119 homers. San Francisco has walked 430 times this year and they have struck out on 1,108 occasions. They have had 1,007 men left on base and have an OPS of .686. They have scored 3.95 runs per game and totaled 588 runs this season. 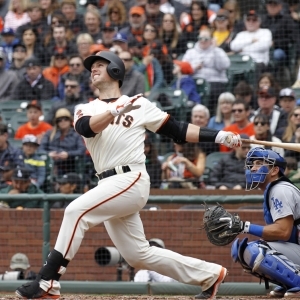 Who will win tonight's Diamondbacks/Giants MLB game against the spread?